I've been thinking about the idea of a series of single hop-varietal beers for a while now. I finally get a chance to test out my theory that this will be excellent insight into individual hop characteristics. 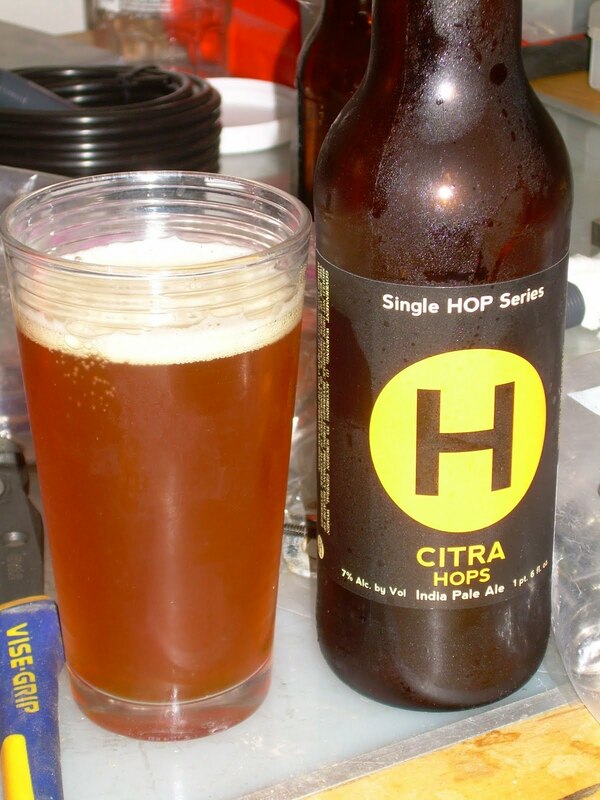 The Citra hop: let's talk aroma. Apparently Sierra Nevada has been instrumental in developing and maintaining this strain and I agree with their description: fruity. I shant mention those extra special esters everyone has been raving about, but I will say that one whiff of this beer and you feel like you're sitting on a beach in Jamaica, boyeee. Unfortunately, after a full 22, I'm not sure this alone can defeat the mighty maltiness of a full bodied 7% ale. Note: When working in the garage, always drink a beer. Circular saw usage encouraged.